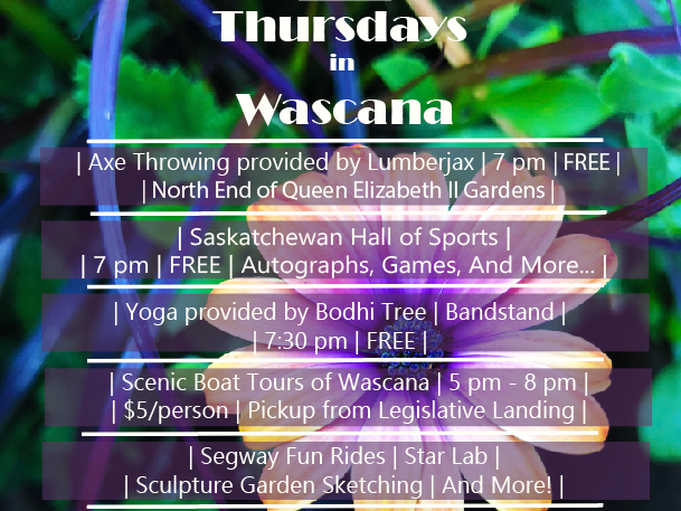 Every Thursday during the summer, look for events in Wascana Centre. We have a great line up so far, including: yoga, escape manor cages, tai chi, sk sports hall of fame pop-up, local barre, Segway tours, paddle events, boat tours and many many more! It's kinda like darts... but not! Axe throwing is one of the fastest indoor growing indoor recreational sports today! We offer complete axe throwing technique and safety lessons prior to each session and then you head into competition matches against your friends with lots of socializing and friendly competition! Partake in this free event, starting at 7pm at the north end of the Queen Elizabeth II Gardens! At 7 pm at the north end of the Queen Elizabeth II Gardens join some Saskatchewan Sports Hall of Fame in some free activities! Take in some free yoga while enjoying the nature of Wascana. This event starts at 7:30 at the bandstand. Cuddle some puppies, and talk to staff about fostering and adoption! 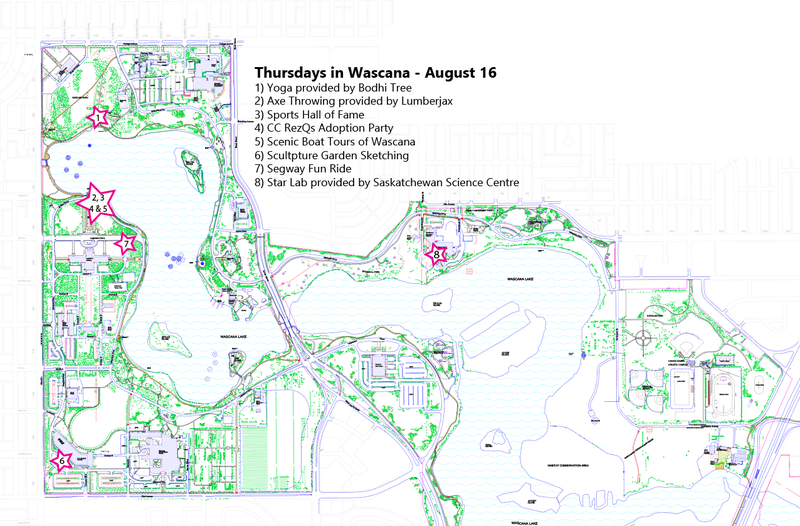 Enjoy a beautiful scenic tour of Wascana from the water for $5/person, from 5:00 p.m. - 7:30 p.m. Pickup is from Legislative Landing every 1/2 hour. These tours will run every Thursday evening this summer. From 5:30 p.m. to 8:30 p.m. try out the Segway/Ninbots around a mini-circuit course for a special rate of $10 for 10 minutes. Safety equipment and lesson provided. No balance, coordination, or experience necessary. Meet at the corner of Legislative Drive and Ave A. * For anyone ages 12 years and older. **12-17 year olds, who are not accompanied by an adult, must bring a signed Liability Waiver with them, which can be printed off at www.rrrtours.caunder the "Book a Tour" page. Go to the MacKenzie Art Gallery to join in some sculpture sketching for free! Class goes from 7 pm to 9 pm. The Persied Meteor Shower may have already peaked, but the science hasn't. Keep you astronomy filled evenings going at the Saskatchewan Science Centre in our inflatable Star Lab starting at 6 pm.